In my current work, I manipulate common glass bottles so they maintain their recognizable origins, but flow and bend in unusual ways as if they were compacted like soda cans. I am deconstructing the vessel and reconstructing it as a new form. In some cases the vessels become metaphors for the shell of the psyche, while other objects represent cultural influences. In other cases, it is purely an experiment with form. The first reaction often is to laugh at the idea of bottles being bent by the force of the breeze from the fan. But I want to evoke a caricature. An idea that seems like an advertising campaign dreamed up by Madison Avenue with a catchy slogan for a soda company. The humor masks a sinister irony. The bottles are almost figurative and bent over as they toil in the heat and perspire in the humid air. The machine represents industrialization and presents a vain attempt at applying a fix to the problems industrialization has created. 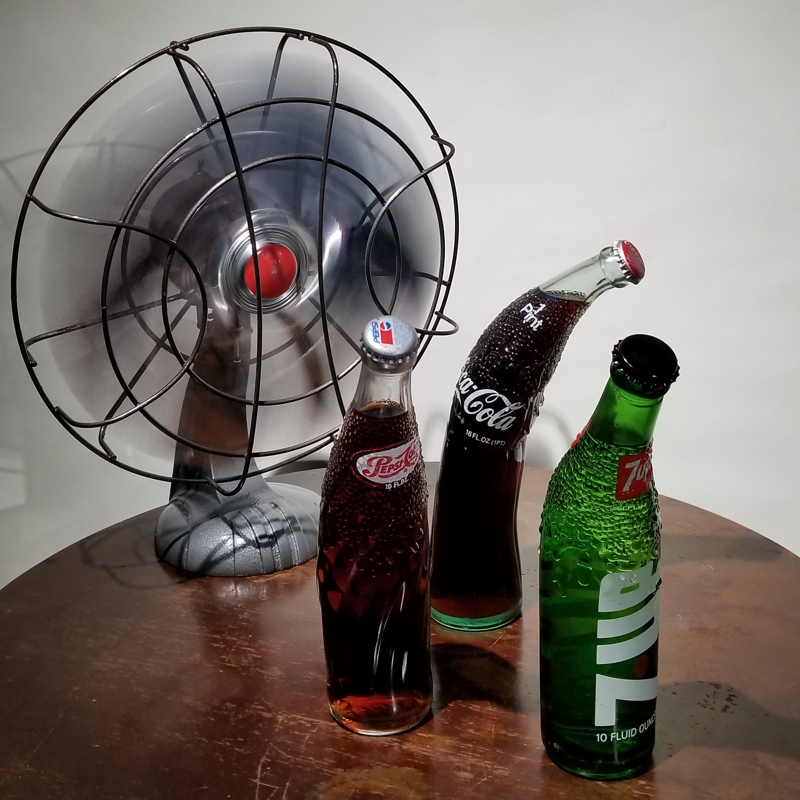 Beneath the humorous visual, a machine blows air across sweating bottles of soda in an absurd and futile attempt to fix the problem that it addresses. Re-formed glass bottles become organic objects that dance in unison, pushed by a current of water or wind and emanating form a cross section of a base substrate with a nondescript surface whose underlying beauty is revealed by its cut and polished sides. The piece reflects my interest in the environment and nature. Found glass bottles, tiger maple wood, and copper wire. Bottles go through a flameworking technique and crackle process to reshape and texture them. The wood includes hand carving and standard wood working processes and a transparent dye finish. Plumbum is the Latin word for lead because it was used in plumbing in ancient times. The elemental symbol for lead, Pb, is based on that word. The City of Flints problems have been in the news for years, culminating recently in the tragic water crisis caused by a failure of government. All of us can sympathize with the horror of toxic water unknowingly entering our home and poisoning our families. 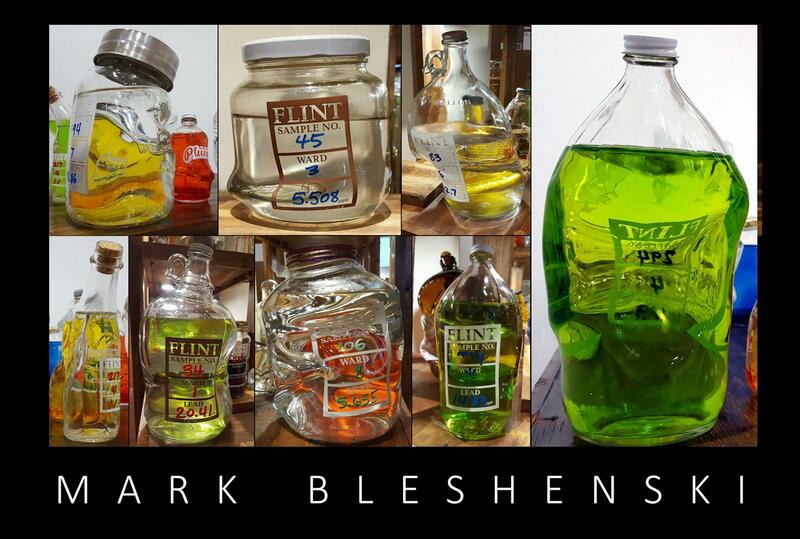 My installation, Plumbum, is a collection of about 100 bottles and jars containing water from Flint faucets. 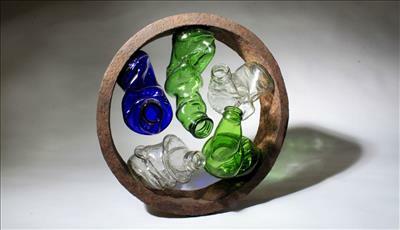 The bottles are contorted and bent to represent the effects of the toxicity of the lead. They are labeled with the results of tap water testing that was done on 300 homes in December 2015 and will display the sample number, the ward, and the lead level of the first draw from those tests. Though it does not actually move, the piece has a visual kinetic property because all the bottles act as lenses, refracting light and causing motion inside them as one passes the work. 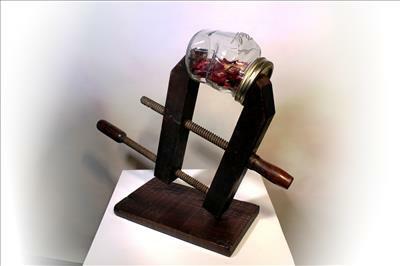 'Inverse Effect' is a mixed media sculpture using kilnworked and flameworked glass, woodworking, and metal casting techniques, combined with constructed and found objects. 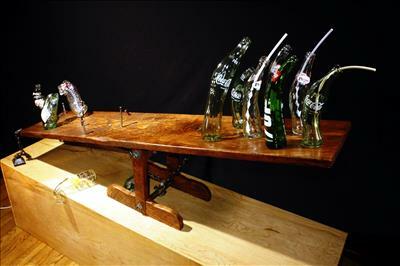 Here, a seesaw is integrated with bottles on each end contorted to represent an emotional gesture. The high end of the seesaw represents privilege, including the middle and upper classes, with the gestures standing tall and above the median. In a sub-theme, they are the popular brands. The low end represents despair, with gestures hunching over and falling off. The title, 'Inverse Effect', refers to the weight the destitute carry as a burden on their lives compared to other social classes. There are fewer on the low end of the seesaw, but they still remain on the bottom. This affects their choices for health, education, economics and lifestyle in general. The sculpture is kinetic; the high end may be gently lowered to try to reverse the effect, but on release it will go back to its original position with the destitute on the bottom. Are they chained to a futile trap of despair? 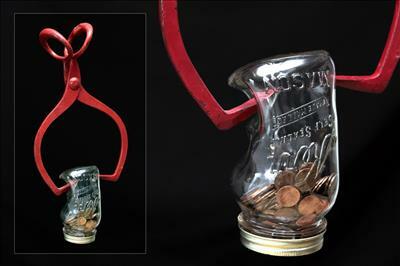 Ice Tongs with suspended penny jar. Twitter is popular for its ability to freely communicate information and ideas. In 2012 it adopted a policy allowing censorship of tweets based on country, to allow the network to grow. 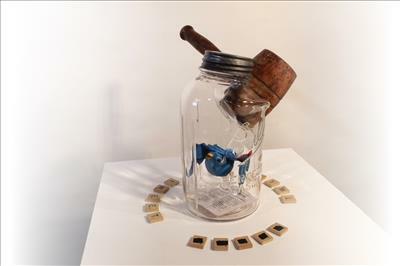 The songbird inside the jar represents the spirit of freedom of speech on Twitter, its wings broken by its keeper. Beneath, a newspaper headline reads 'Twitter Breaks Wings off Songbird'. The mallet hitting the jar conveys Twitter taking a strike at freedom of speech and those who would use it. Tiles around the outside of the glass cage read: 'TWEET TWITTER CHIRP', but the word chirp has been censored. The newspaper article also displays this lyric from a pop song of the 70's by Blanchard & Morgan: 'Take away their chirp and the birds will have to whisper when they sing'. The words in the glass jar label it as 'Wide Mouth'. Letter tiles from a parlor game gathered inside the mason jar, reveal the word 'Rebel'. The defiant vessel is pressured by an old wooden clamp to conform to its forces. It convulses from the strain. Society and social groups apply pressure to conform to their ideals. The vessel is changed, but maintains its memory. 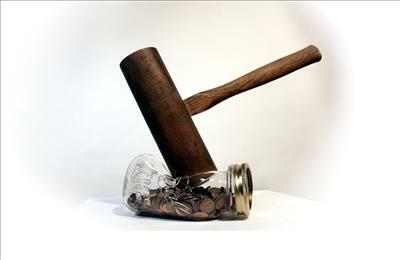 The ubiquitous penny jar. Object of dreams and desires. Small bits of wealth, too unimportant individually, are stored away for the future. Like knowledge and experience, small bits seem unimportant by themselves. But when combined with others, become a proper and crucial wealth of experiences. A sculpture of flame worked and kiln formed glass and mixed media. I want to smash it. An experiment or sketch relating to flow. The rough and rugged iron ring is a found object from a hike somewhere, saved to be re-purpose in an art piece. 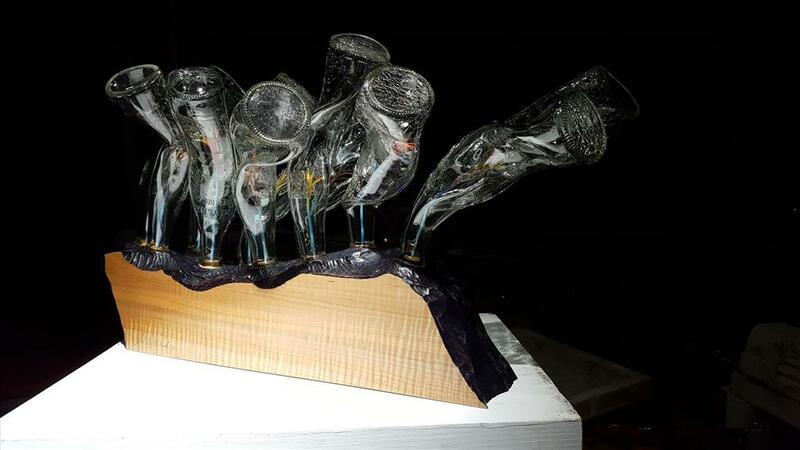 The bottles I was working on looked as if they were in motion, so the design reflects liquids flowing through a tube.